We understand that tuition rates are an important factor when deciding on a school. Tacoma Baptist Schools is committed to making christian education affordable. We want to help your family discover if our school is a good fit and then work with you to make the numbers add up. Discounts apply to tuition only and are not applied to Student Service Fees or Optional Program Fees. Multiple discounts are not awarded. Who Is Eligible to Receive the Family Referral Reward? Returning families, faculty, & staff are eligible. How Does It Work? 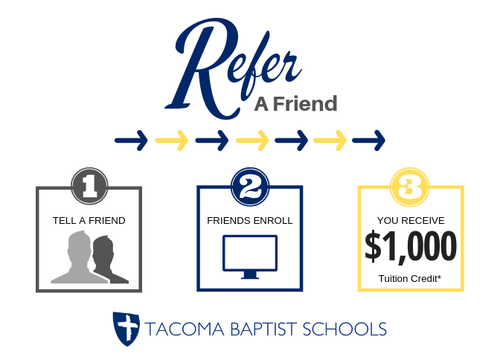 All returning TBS families who refer a new family that enrolls and attends for the 2019-20 school year receive $1000 to be applied to their school account in the Fall ($500) and Spring ($500) semesters. All families must remain enrolled and in good standing for the school year to be eligible for the discount. After submitting an application for admission, families can start the process of applying for tuition assistance. Apply online at online.factsmgt.com/aid. The priority deadline for returning families to apply for assistance is June 1. The amount awarded is 0% - 40% (to include any multiple-child discount) and is applied to tuition only. For a complete list and description of Tuition and Fees for the 2019-2020 school year, please see the attached document.